Terms and conditions of use - Deliver-Grocery Online (DG), 9354-2793 Québec Inc. Merchandise may be returned for the refund within 14 days of purchase with "original tags and packaging". Some exceptions apply to the items with soon expiration dates. Our customers' health is very important for us. So in order to be sure about it, we will not accept returning of such mentioned items after purchases. We will pick up your items that you want to returns from your address if you are at Montreal and in our defined delivery zones. It costs $15. But, you still can return items for FREE!! All you need is to have a new purchase with us. When our delivery team comes to deliver you your new items, you can return your old items for FREE. If we send your order by Canada Post, you still can return it. But you have to pay for the shipping and we are not responsible for the shipping price. If you select to ship your order with Canada Post, we add a shipping cost to your order first and we will adjust the real shipping cost when your order is ready to ship. 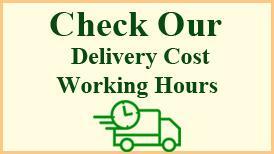 If the shipping cost is less than what we charge you for the order, we will reimburse you. Also, if the shipping cost is more than the paid one, we will ask you to pay the difference.